Stem cells are in the news quite often. Stem cell technology can be complicated and difficult to understand but the way in which it is opening up our understanding of development and disease processes is amazing. A stem cell is basically a type of cell that gives rise to many types of different cell. It’s a sort of ‘super parent’ cell. The ultimate stem cell is the fertilised egg. This one cell divides over and over to produce all the cells of the human body as it develops into a new human being. Embryonic stem cells are very important to research but also very controversial. Some people don’t agree that a fertilised embryo should be split apart to produce cells for research – even though that embryo itself would never be destined for human life. In the adult body, there are still a few stem cells. These provide the body with the source of new blood cells and other cells. One stem cell can produce offspring cells that divide many times and then become specialised, so that a new supply of red or white blood cells is always possible. How Can Stem Cells Increase our Understanding of Infertility? This is something that has happened fairly recently and was only published in 2009. For the first time, researchers have been able to take stem cells and encourage them to divide and specialise to become early stage human egg cells and human sperm cells. Studying how this process happens is full of information and quite a few surprises. It can also allow scientists to see how sperm and eggs develop in the human body. The more we can understand about the natural process of sperm and egg production, the better we can understand what happens when things go wrong. Many cases of infertility are caused by sperm being faulty – either not enough are made, or the ones that are made don’t swim very well. Understanding how eggs form can also help shed light on the process of ovulation – which is defective in some women who are unable to conceive. Scientists are not just looking at the way eggs and sperm are produced in the human body. They are tracing the development of these important reproductive cells right back to the baby and the early stage embryo before that. Some of the factors that are important are genetic – and they are apparent and also make their effects felt at an early stage. Long before a man or woman even thinks about starting a family. Using special staining techniques to label up cells that started to develop into sperm or eggs, researchers started to decipher which genes were involved in switching stem cells to specialise to become gamete cells. They found that one gene acts right from the very beginning, pushing some cells in the early stage embryo to eventually turn into the eggs or sperm in the adult that forms from that embryo. All very interesting, you might say, but how can that help me become pregnant if I am having trouble? It may be a long way off but this research may mark that start of being able to take cells from your ovaries and ‘instruct’ them to produce your own eggs, but in vitro, in the lab, not in your body. The same with sperm. 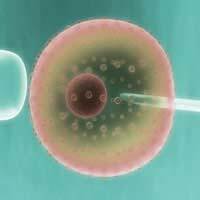 Couples who are unable to produce enough of their own eggs or sperm, or to produce viable cells, may be able to conceive their own genetic child using stem cell technology. Some scientists doubt that this will happen though. They think it will be more likely that knowledge of the genes involved will allow doctors to use medicines to stimulate the body to produce healthy sperm or eggs in the right quantities in the future. Common Questions: What Do You Know About Infertility? Not Conceiving: Have You Tried This? Infertility - the Scale of the Problem?